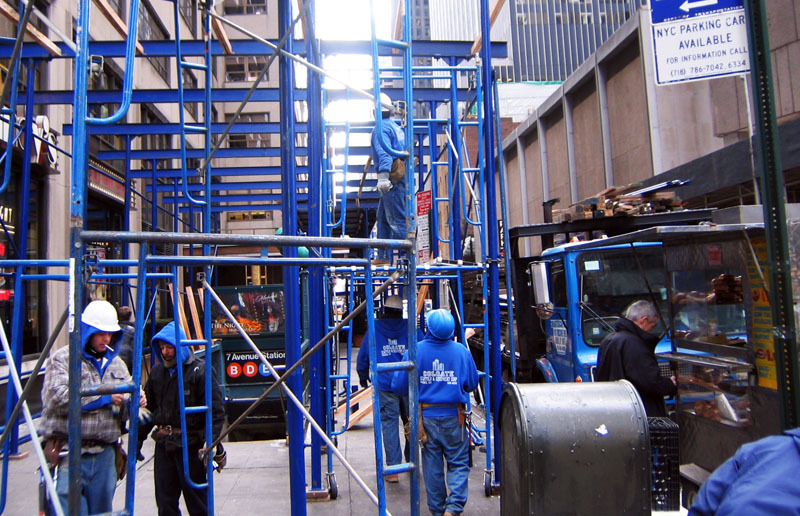 It definitely seems that every day, more of New York City is covered by the ubiquitous wood and steel building shed scaffolding, making daily life an urban obstacle course of weaving and tunnel trekking. It’s not just your imagination: Currently there are almost 9,000 sheds camped out over city streets, reports Crains, based on numbers from the Department of Buildings, up from around 3,500 in 2003. That adds up to 190 miles–one million linear feet—worth of sheds, enough to encircle Manhattan six times. The city’s maze of construction sheds are the result of a 1980s law and a billion dollar industry that keeps growing. “New York is insatiable right now when it comes to sheds,” says George Mihalko, a shed-equipment supplier. “I’ve never seen anything like it in 30 years.” This demand is driven in part by the new wave of construction spurred by the city’s building boom. But there is apparently another, more important reason. But that doesn’t mean we have to like them. Besides being an obvious eyesore, sheds themselves can be hazardous safety-wise. Crains reports that last year, Mayor Bill de Blasio described the sheds as “great for criminals as a place to hide.” His administration recently announced a “shed safety sweep” to ensure they are well-lit and code-compliant. They’re also bad for business, sometimes causing restaurants to close because potential diners are driven away to unencumbered establishments nearby, resulting in lawsuits and settlements. Attempts to make the sheds more attractive–such as a contest held six years ago whose winner, Urban Umbrella, was “an attractive assemblage of high-strength recycled steel, translucent plastic and LED lighting” have failed due to comparatively high costs and difficult assembly. “Indeed, ideas to make sheds look better almost invariably go nowhere because developers figure that no one ever paid more to rent an office or buy an apartment because the building once had a nice-looking shed.” So the cheap, easy to install steel-and-wood sheds continue to sprout and multiply like urban mushrooms even among the city’s newest architectural innovations. 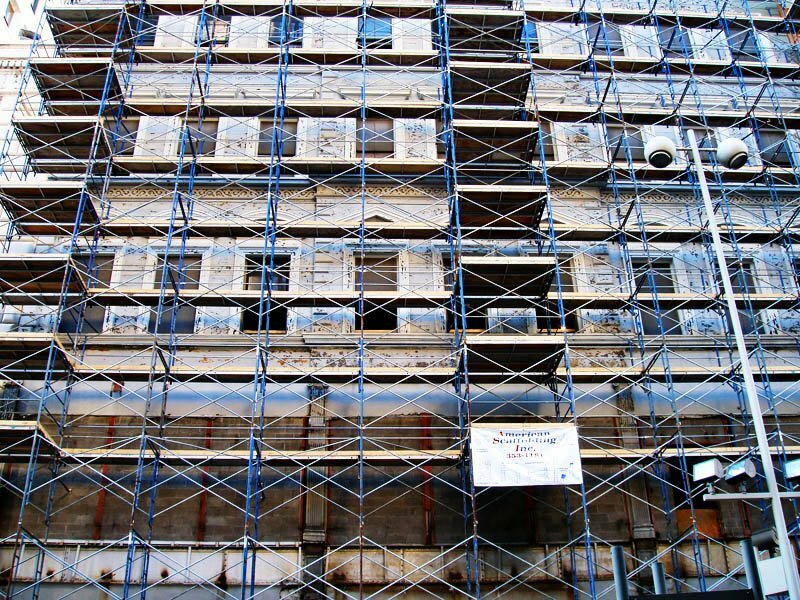 And though complaints–and costs to building owners–pile up as quickly as the scaffolding, the results are notable in terms of building safety: “Complaints about falling bricks or other debris decreased by more than half from 2005 to 2015, according to city records of 311 calls. So it looks like New Yorkers are stuck with the sheds (their familiar soul-deadening green color, named “Hunter Green 1390,” made by National Paint Industries in North Brunswick NJ, is the result of an edict by the Bloomberg administration). Though historic precedent puts us in good company: The ancient Greek historian Herodotus reportedly has described how scaffolding was used to build the pyramids in Egypt.